Please note that the content of this book primarily consists of articles available from Wikipedia or other free sources online. Khouma El Hadji Babacar (born 17 March 1993) is a Senegalese footballer who plays for Serie A club Fiorentina. 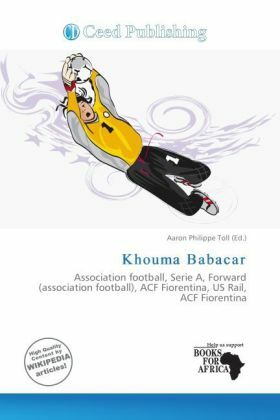 Babacar began his career in the academy of US Rail in his hometown Thiès and moved to Italy in summer 2007 signing with Pescara after a successful trial. After only a year with Pescara, on July 2008 he signed with ACF Fiorentina, after also being highly tracked by another Serie A side, Genoa. In the 2009 10 season he joined up with the first team coached by Cesare Prandelli. On January 14, 2010, at the tender age of 16 he made his debut in the starting line-up against Chievo, in the round of 16 clash from the Coppa Italia. His debut was marked by a goal, scoring the temporary equalizer in the 75th minute, with the match ending 3 2 for the Viola. On March 20, 2010, he scored his first league goal, snatching the third goal of the 3 0 home win over Genoa.